Flexagon approaches defence from a new angle, bringing together elements of man-to-man and zonal defence. Flex is neither “man” nor “zone” – it’s a hybrid. Pressure is applied to every offensive player, whilst the defenders are constantly working together as a team. Consider a vertical stack. If every defender marks man-to-man, then they are all essentially trying to cover the same open side spaces, leaving the force to cover the break side. This uses very little teamwork. However, every offensive player is under pressure from a defender, which is good for the defence and bad for the offence. If the defence plays a zone, then the stack is cancelled and the offence spreads out and becomes a ‘zonal offence’. Zonal defence often leaves offensive players unmarked. Some passes have no pressure on them, as defenders are often overloaded in other areas. When an unmarked offensive player receives a pass, zone often breaks down as multiple continuation passes are possible. However, the defenders are using teamwork and covering a different spaces, which is good for the defence and bad for the offence. Against man-to-man defence, offensive players are best positioned near to each other. Against a zonal defence, offensive players are best spread out. The principles of Flexagon Defence provide the appropriate coverage to any setup, forcing the offence to constantly adapt. Imagine every defender on the field has an area around them they are covering – a circle of influence, if you will. When circles are packed together in nature, they fall into the most efficient pattern. 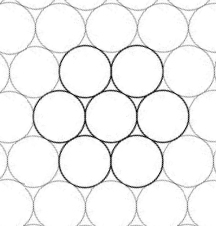 One circle touches six circles around it, leaving the least amount of wasted space. The most efficient way seven players can arrange themselves to cover the maximum amount of space on a field is in a hexagonal formation with a central point, as illustrated in bold on the right – which could be looked at as a 2-3-2. In Ultimate, players on offence will occupy different spaces and not often fall into this formation, so the hexagonal defence setup needs to be highly flexible to account for these changes – a flexible hexagon – a Flexagon. The offence has the advantage. The defence must try to punish any inefficiency by the offence in order to get the upper hand. As a defensive team, it’s important to remember we have the same number of players on the field as the offence – but one of their players isn’t allowed to move (the thrower). However, gaining the upper hand for defence requires maximum teamwork, and is an incredibly complicated task. The shout ‘Push’ can be used to move nearby defenders away from you. This is useful when you realise you are both covering the same space, or when you see an unmarked offense player the other side of a team mate. When you hear “Push”, you should move directly away from where the voice came from. Example animation here. The shout ‘Pull’ is the opposite to ‘Push’ – use “Pull” when you want defenders to come towards you, or to area near you. This is useful when you find yourself covering two or more players, or when you can see an unmarked offensive player near to you. When you hear “Pull”, you should move towards where the voice came from. Example animation here. The basic formation can be described as 2-3-2. The terms “forward” and “back” refer to how you see the field when on the line before a point. 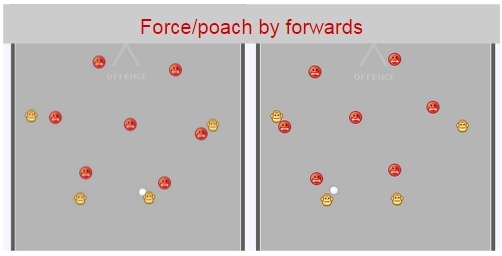 The formation entirely morphs depending on the position of the offensive players – if there are three handler players for the two forwards to mark, a wing should essentially move into a forward position. Positions can and should switch during a possession – quite often it makes more sense for a defender to stick with their mark than to pass them off – other defenders should adjust accordingly. A defender may start as a ‘back’, then transition into the ‘hat’ position, and end up as a ‘forward’. Abiding by the principles makes these dynamic positional switches possible. The force – if the disc is near the middle then force towards the middle, as this leaves a wing player on one shoulder, and the other forward on the other. If the disc is near the sideline then force towards the line – this leaves a defender on either shoulder also. Abiding by the principles means that it’s not necessarily a ‘forward’ player that puts the force on. Want videos of Flex in action, or vocal explanations and stuff? Keep updated through the Hexagon Ultimate YouTube channel.